An English gentleman circa 1750 with his flintlock muzzle-loading sporting rifle, in a painting by Thomas Gainsborough. French flintlock pistol circa 1790–1795. Antoine-Henri Jomini, a celebrated military author of the Napoleonic period who served in numerous armies during that period, stated that the majority of bayonet charges in the open resulted with one side fleeing before any contacts were made. 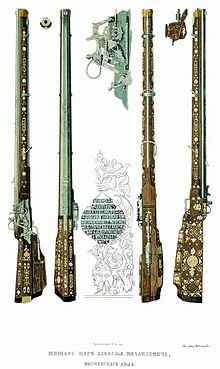 Flintlock weapons were not used like modern rifles. They tended to be fired in mass volleys, followed by bayonet charges in which the weapons were used much like the pikes that they replaced. [dubious – discuss] Because they were also used as pikes, military flintlocks tended to be approximately 5–6 feet (150–180 cm) in length (without the bayonet attached), and used bayonets that were approximately 18–22 inches (46–56 cm) in length. Some flintlocks were rifled. The spiral grooves of rifling make rifles more accurate and give a longer effective range – but on a muzzle-loading firearm they take more time to load due to the tight-fitting ball, and after repeated shots black powder tended to foul the barrels. Military musketeers couldn't afford to take the time to clean the rifles' barrels in between shots and the rifle's greater accuracy was unnecessary when tactics were based on mass volleys. Most military flintlocks were therefore smoothbore. Rifled flintlocks did see some military use by sharpshooters, skirmishers, and other support units; but most rifled flintlocks were used for hunting. 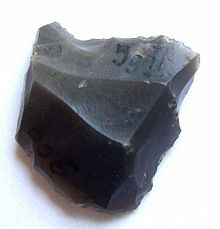 Most flintlocks were produced at a time before modern manufacturing processes became common. Even in mass-produced weapons, parts were often handmade. If a flintlock became damaged, or parts wore out due to age, the damaged parts were not easily replaced. Parts would often have to be filed down, hammered into shape, or otherwise modified so that they would fit, making repairs much more difficult. Machine-made, interchangeable parts began to be used only shortly before flintlocks were replaced by caplocks. 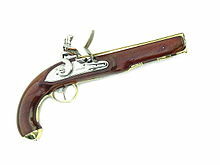 Firearms using some form of flintlock mechanism were the main form of firearm for over 200 years. It was not until Reverend Alexander John Forsyth invented a rudimentary percussion cap system in 1807 that the flintlock system began to decline in popularity. The percussion ignition system was more weatherproof and reliable than the flintlock, but the transition from flintlock to percussion cap was a slow one, and the percussion system was not widely used until around 1830. The Model 1840 U.S. musket was the last flintlock firearm produced for the U.S. military. However, obsolete flintlocks saw action in the earliest days of the American Civil War. For example, in 1861, the Army of Tennessee had over 2,000 flintlock muskets in service. As a result of the flintlock's long active life, it left lasting marks on the language and on drill and parade. Terms such as: "lock, stock and barrel", "going off half-cocked" and "flash in the pan" remain current in English. In addition, the weapon positions and drill commands that were originally devised to standardize carrying, loading and firing a flintlock weapon remain the standard for drill and display (see manual of arms). ^ Lynn, John A. Giant of the Grand Siècle: The French Army, 1610-1715. Cambridge: Cambridge UP, 1997. Print. ^ Jomini, Antoine Henri. The Art of War. Westport, CT: Greenwood, 1971. Print. ^ Dennis E. Showalter, William J. Astore, Soldiers' lives through history: Volume 3: The early modern world, p.65, Greenwood Publishing Group, 2007 ISBN 0-313-33312-2. ^ Day of Concord and Lexington (French, 1925) p. 25 note 1. See also pp. 27-36. This page was last edited on 29 March 2019, at 23:04 (UTC).